Hi friend! I hope you’ve had an excellent weekend. I’m not sure about you but as soon as it gets cold out I just start eating soup for like… 2 or 3 meals a day! There’s something so cozy about a bowl of soup, like a little hug from the inside. Today we’re taking advantage of some of the seasonal root veggies that are more prevalent at farmer’s markets and grocery stores at this time of year. The base of our soup is a mixture of sweet potatoes and beets. Sweet potatoes are a great source of beta-carotene to provide antioxidant support to our bodies during the harsh winter months. 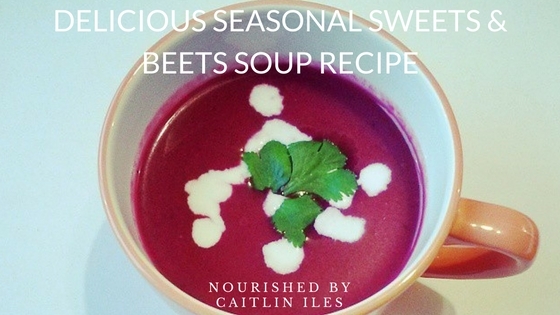 The real star of this soup and the beauty that gives us such a vibrant colour are the beets. These vibrant gems contain specific phytonutrients called betalains. Betanin and vulgaxanthin are the two best-studied betalains from beets, and both have been shown to provide antioxidant, anti-inflammatory, and detoxification support. The detox support provided by betalains includes support of some especially important Phase 2 liver detoxification steps involving glutathione, one of our master antioxidants. There’s very little in your body that isn’t impacted by your glutathione levels, so eating up your beets is a great way to give your body and liver a helping hand. Anyhoo, lets get down to business! Place a saucepan over low-medium heat. One heated add onions and garlic and allow to simmer for 3-5 minutes until translucent and slightly caramelized. Add sweet potato, beets, and thyme and stir to combine. Add water or broth, cover and turn heat to high. Bring to a rolling boil then reduce heat to simmer for 20 minutes or until beets and sweets are fork tender. Remove from heat, puree, add a splash of apple cider vinegar and season with sea salt. Return to heat for 5 minutes. Well that’s my recipe for this week friend. If you’re looking for more awesome ways to naturally support your body’s natural detoxification pathways then make sure you download my FREE Fantastic Fermentables E-Book by clicking here. Have a wonderful week! !